With Lync 2010 we now have a single client for Lync Client and the Online Meeting (formerly called Live Meeting) functionality which makes everything a little simpler. If you have the Lync Client you get your meeting functionality and the Outlook integration for scheduling online meetings all from the one client. Even better than the single install for our own clients is the capability to customize the meeting entry page that is sent as part of the Online Meeting invite. 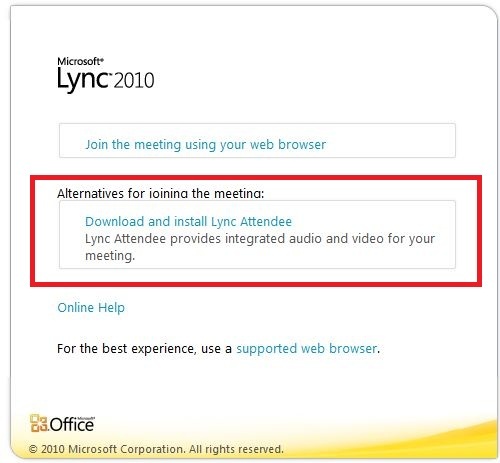 This makes it easier for external contacts that don’t already have the Lync client or attendee to join the meeting (if the Reach client doesn’t provide the functionality they need for the meeting). To customize the page we need to use the Lync Server Management Shell (LSMS). 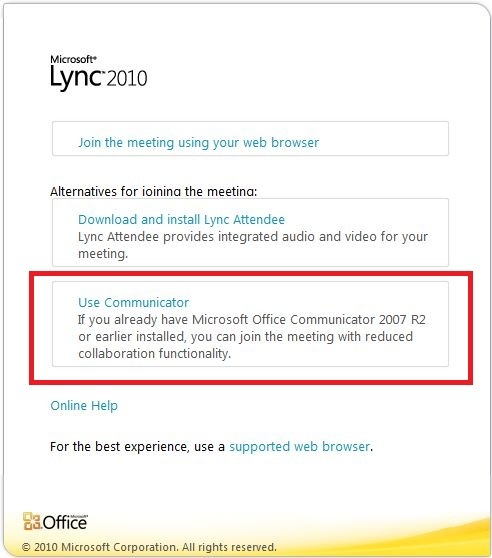 The lack of these options was definitely felt in OCS 2007 R2, just another way Lync is making the user experience even better! This entry was posted in Uncategorized and tagged Customize Lync, Live Meeting, Lnyc Online Meeting, Lync 2010. Bookmark the permalink. Thank your for posting this on my birthday! Next, if you have ever used Webex you know that every client has a “landing page” where they can manually enter a meeting number, see available conferences, etc. Is there any way to configure this type of “landing page” for Lync? Are there any third-party add-ons that do this? I’d love an answer to Will’s question as well. It would make life for our Tech Support teams much simpler to have a landing page where they can launch a meeting and then ask the user to log onto a “meet.mycompany.com” kindof page and simply key in the meeting number. Sorry all, I’m not aware of a way to make this happen. You’ll need to make a suggestion to MSFT for that. Thanks for the update. We put in a request to Microsoft and was told that it was in “the development pipeline” for a service pack. No ETA, though. Clearly enough people have spoken that they are working it into the backlog. That would cover scheduling, but does it cover the join experience without a custom URL? Allowing the end user/customer to enter their meeting ID? I could see writing a quick web app that acted as a landing page before the landing page, it could take the input and then convert it to an actual meeting URL, but the validation of the input could get tricky. Yeah. the URl is …/username/meetingId. It would be tough to code that without complex AD queries and I believe the Lync Edge Servers don’t live in the domain. Right, so you wouldn’t be able to just prompt for a conference ID, it would have to be a user as well. It wouldn’t use the edge servers though, it would be based on the reverse proxies, hitting the directors or FEs. In theory you could build your own app that did a DB lookup against the Lync BE databases to find the username associated with the conf ID and then formatted the URL and did a redirect for the webpage user. This doesn’t take things like information privacy or performance into consideration.